The Sneem Sculpture Trail is a collection of statues and monuments that are located throughout the village of Sneem, around the fair greens and churches. The map shows their exact locations, they are easily accessible to all. Start in the South Square Fair Green at the President O’Dalaigh Memorial, then stroll down to St. Michael’s Church, walk around to the left of the front steps to see the Risen Christ. Go back out the gate or down the steps on the other side of the front door and discover The Way the Fairies Went, also known as the Pyramids. Walk back up towards the green, turn right at Quills and across the road from Erin Country Knitwear, you will see the Peaceful Panda from China. Cross over the road and in the corner of the South Square, you will find the statue of Steve “Crusher” Casey. Coming back towards to village centre, on the corner of the green is the newest addition to the Sneem Sculpture Trail, the John Egan Memorial. 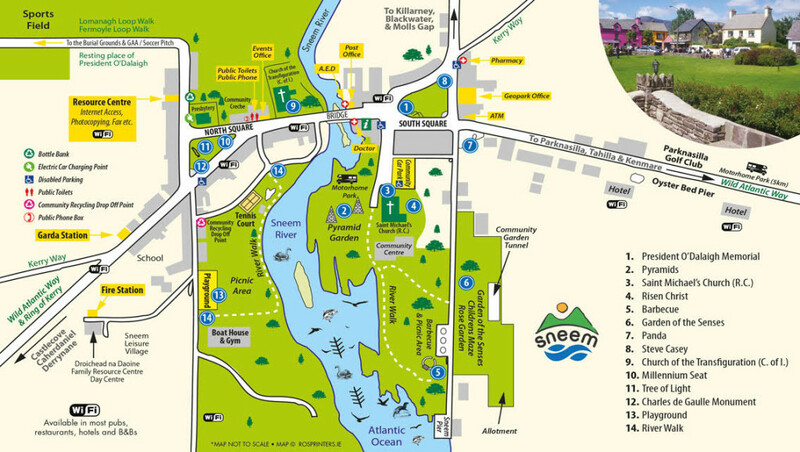 Continue around or through the Green, then cross over Sneem Bridge to the North Square. Pass by the Church of the Transfiguration and look up at the salmon weathervane. At the nearest corner of the North Square, you will find the Millennium Seat. Located in the North Square Fair Green is the Steel Tree. In the left hand corner of the green, you will find the Charles de Gaulle Memorial.